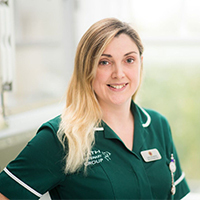 Cathy joined in 2009 after graduating from Bristol University with a degree in Veterinary Nursing. In 2014 she completed the advanced nursing diploma in Clinical and Professional Veterinary Nursing with the Royal Veterinary College. Working as Senior Surgical Referral Nurse she has a strong interest in surgical nursing and wound management.